The South Puget Sound Agricultural Producer Needs Assessment was conducted in 2016 and 2017. In order to document farmer needs for internal (WSU Extension) use, as well as for a South Sound region audience, several partner organizations engaged in and supported this effort. The Thurston Economic Development Council, Thurston Conservation District, and WSU Extension Lewis County partnered on data collection. 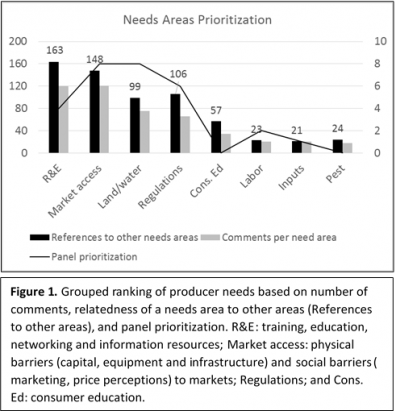 These rankings are based on (1) the number of comments documented per needs area, (2) a measure of the relatedness of one needs area to other needs (see methods), and lastly (3) a review by a local panel of farmers and Thurston County agriculture committee members. Figure 1 reports the results of assessment rankings. 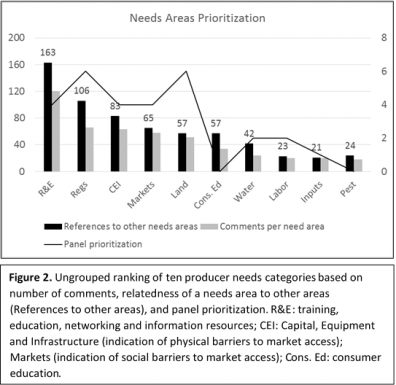 Market access: Among the ten needs areas identified in this assessment, ‘Marketing’ and ‘Capital, Instructure and Equipment’ are consolidated here because the former focuses on social barriers to expanding market access, while the latter focuses on physical barriers. Combined, removing barriers to market access emerges as a primary needs area for farmers in the region, addressing issues on the physical barriers side such as: equipment needs, processing and storage facilities, feed grain and seed processing, and variety trialing; and on the social barriers side such as: consumer perceptions about cost, loss of market share for local farmers, collective marketing, and marketing skills. 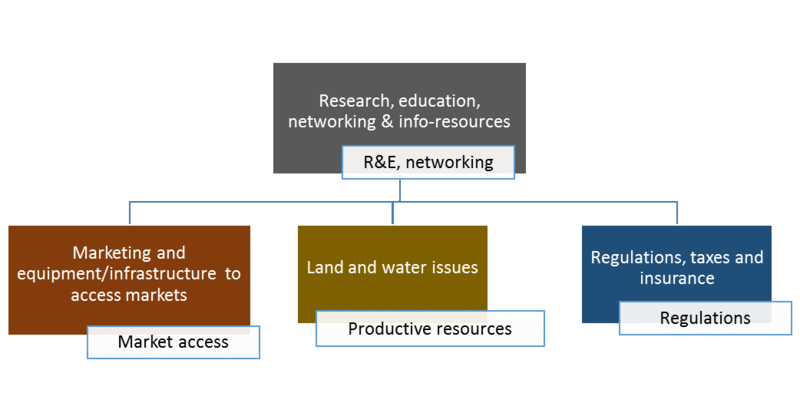 Productive resources: Needs related to access to land and water were identified as two of the ten categories in this needs assessment (Figure 2). They are combined here because access to basic productive resources is a coherent, basic need among farmers in Thurston County. This need is compounded by escalating land prices and increasing competition for water resources, both driven by development pressure and resource conservation issues. Producer needs in relation to land and water included knowledge of available farmland (database) for lease or purchase, more purchase of development right opportunities, zoning compatible with long-term agriculture, consultation with farmers concerning critical species/habitat decisions, better financing options, succession planning resources and tools, water use adaptation recommendations and farmer networking to respond to climate change, water conservation planning resources, and support and more tools for water rights identification, acquisition, banking and trading. Regulations: Regulatory issues ranked high (on their own, ungrouped) as one of ten needs categories. Needs regarding regulatory issues were widely linked to other needs, such as access to land, to water and water rights, and to labor, as well as in relation to taxation and insurance issues, among other needs. Regulations were seen as often at odds with sustaining long-term agriculture in South Puget Sound. Agricultural producers wanted more local control over decisions restricting use of productive farmland, site specific (not one-sized) tools to co-manage natural resources and farm operations, cooperative and not punitive relations with regulators, support navigating regulations such as concerning food safety, size-neutral taxation structures, and more cost-share and incentives for the ecosystem services and natural resource management that farmers are currently managing for, and increasingly being required to manage for. Full needs assessment draft report available here. For information on the steering committee addressing the need for value-added processing capacity in the region, please email us.